As gasoline prices rise above $5/gallon in LA (see video below), analysts are puzzled. Gasoline prices have been on the rise for the past 31 days, which is highly unusual for this time of the year. Typically prices begin rising in March or April as the driving season kicks off. The price increases are particularly puzzling, given the fact that US gasoline markets have been well supplied relative to historical levels. Certainly the recent increases in crude oil prices have been a large part of the explanation. Some have suggested that increased demand due to stronger global economic activity is to blame. Other reasons have been proposed as well. CNN: – What’s behind the higher prices at the pump? It’s a confluence of factors, from rising crude oil prices, to production cuts and refinery closings. “Right now, things are tight worldwide,” said Ray Carbone, president of New York commodities trading firm Paramount Options. 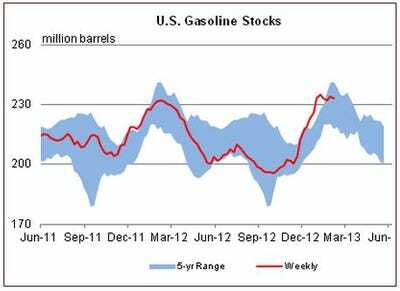 “Refineries going down, unanticipated maintenance, and higher demand … going into driving season. Gasoline futures trading on NYMEX (CME) have been rising almost daily, pointing to even higher prices at the pump in the spring. This is clearly going to create headwinds for consumer sentiment and ultimately spending patterns, particularly when combined with other issues consumers are facing this year. CNN: – It’s hitting wallets right in the middle of winter, when people are already looking at large home heating bills. And it comes just after many Americans have been hit with smaller paychecks, and are worried about looming budget cuts that could deliver an even deeper blow.